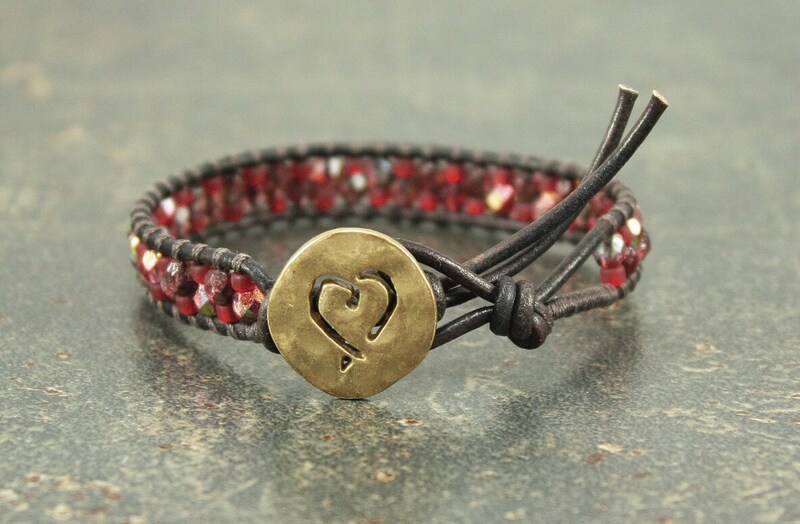 This pretty bracelet features a gold tone heart button that I've paired with dark brown leather, red seed beads, and red Czech glass beads with an etched finish that sparkles in silver and gold. The bracelet is 3/8 inch wide. The bracelet is 7 1/4 inches long and fits an average 6 1/2 inch wrist. Wonderful rabbit bracelet!! My granddaughter will love it!! A++++. Beautifully boxed too. Thank you. Love the bracelet! I shall treasure it! Absolutely love it.. I will definitely order another bracelet soon. I accept all modes of payment available through Paypal, as well as direct payment by credit card. If you are not satisfied with your purchase for any reason, you may return it within 7 days of the date of purchase. Buyer pays return shipping. If you experience a problem with any item, I will refund or replace the item. In short, I will work out an arrangement to compensate you for your time, inconvenience, and dissatisfaction. All deposits on custom orders are nonrefundable. I ship as quickly as possible, within 48 hours at the latest and same day if possible.